London bus and Tube fares and the congestion charge are to rise to pay for investment in transport. Mayor Ken Livingstone told BBC London he would decide on prices in the next few weeks, but they would rise by at least the rate of inflation. He said he was determined to take "painful" decisions in order to keep investing in transport. He denied the rise was to fund the shortfall in predicted revenue from the £5-a-day congestion charge. 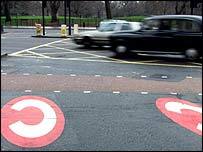 In July, the fine paid by people who drive into central London without paying the congestion charge rose from £40 to £50. Mr Livingstone said new measures by Capita, the company that runs the charge, meant more fines were being collected. And he said bus fares would probably still be lower than before 2000 as he had cut them dramatically when he was first elected. But the number of people using London's buses has shot up 31% between 1999 and 2003 and the mayor says he needs more money for new buses. "What is the choice here? Shall I keep the fares lower so the service slowly gets constricted, or do we keep on expanding?," he said. "The real weakness of British politicians for the last 35 years is they have always taken the softer option of not doing the investment, the long-term building. "I want to make certain in this term, even if it's painful, we start the projects we have been talking about for the last 30 years."